Alpha Kappa Alpha is the first Black Greek-letter sorority. It was founded at Howard University on January 15, 1908. 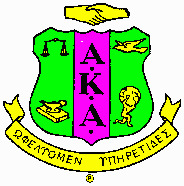 In January 1913, Alpha Kappa Alpha Sorority was incorporated.